Doctors, nurses, retirees, hospital groups, Democrats and both moderate and conservative Republicans have criticised the Trump administration's plan to repeal and replace the Affordable Care Act, known as 'Obamacare'. 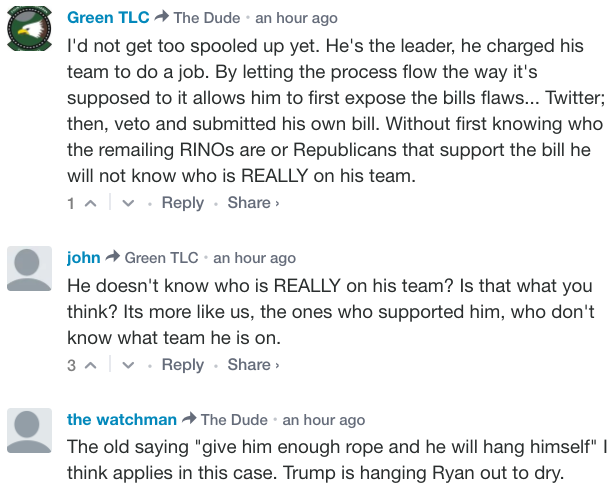 Trump's supporters despise the American Health Care Act as well, but rather than accepting the president may not have their interests at heart, they're hoping his support of the bill is a clever negotiating tactic. 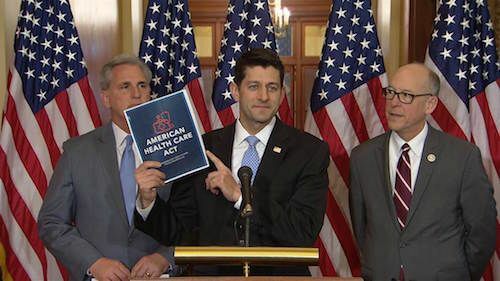 A leaked White House analysis of the GOP bill forecast it would lead to 26 million Americans losing their healthcare coverage by 2026, exceeding the estimate of 24 million by the non-partisan Congressional Budget Office (CBO), with which the government "disagreed strenuously". However, as this is the first of three parts of the repeal process, Trump's team argues a fair analysis would consider the plan in its entirety. The bill includes a tax cut of $883 billion, with $274 billion of that going to the wealthiest 2% of Americans. Moreover, it strips $880 billion from Medicaid, a federal and state programme that provides means-tested health coverage to over 70 million Americans, nearly three-quarters of whom are elderly, children or disabled. The upside is that the plan is predicted to reduce the federal deficit by $337 billion over the next decade, although that largely reflects the cuts to Medicaid and fewer tax credits for low-income taxpayers. In short, the bill disproportionately harms the sick, needy and elderly, and redistributes money from the poor to the rich. 'Trumpcare' retains popular aspects of Obamacare, such as allowing Americans under the age of 26 to remain on their family's healthcare plan and ensuring those with pre-existing conditions aren't charged more or denied insurance. 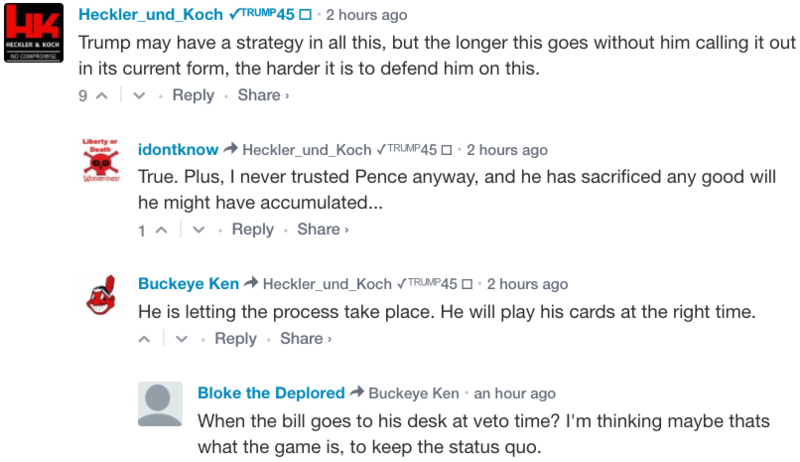 But it removes the individual mandate, which requires Americans to pay a penalty to the government if they don't buy health insurance, in favour of enabling insurers to charge people 30% more if they purchase coverage in a given year after foregoing coverage for 63 days or more in the preceding year. Trump secured the presidency largely thanks to overwhelming support from elderly, blue-collar Americans. Many believed his pledge to lower insurance premiums, expand coverage and offer better-quality healthcare, if not his promise of universal healthcare. 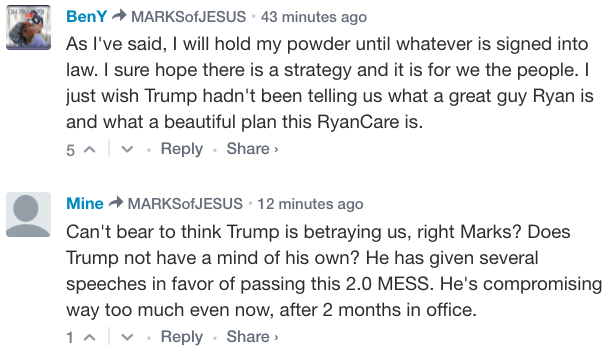 Now, they're struggling to explain why Trump is backing a plan that threatens to reduce healthcare subsidies for the poor and raise insurance costs for the elderly, making coverage unaffordable for many of them. 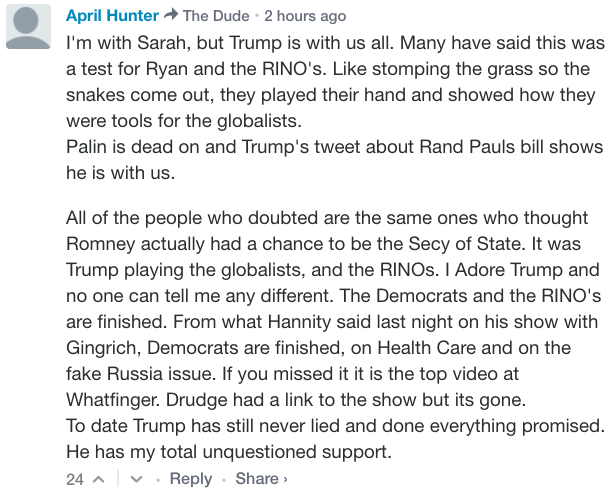 Commenters on Breitbart, a hub for die-hard Trump supporters and the alt-right, aren't sure what to think. 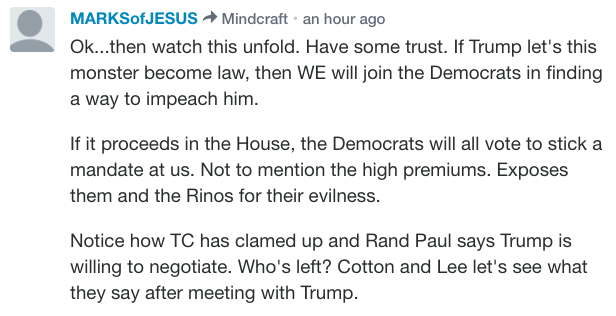 Their reactions have ranged from fear and confusion, to hoping that this is a negotiating ploy and Trump is setting up House Speaker Paul Ryan, to calling him a conman and threatening to join Democrats in seeking his impeachment. 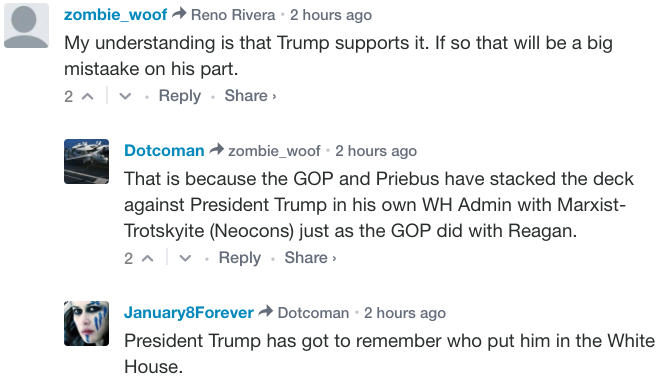 A selection of their comments is shown below. 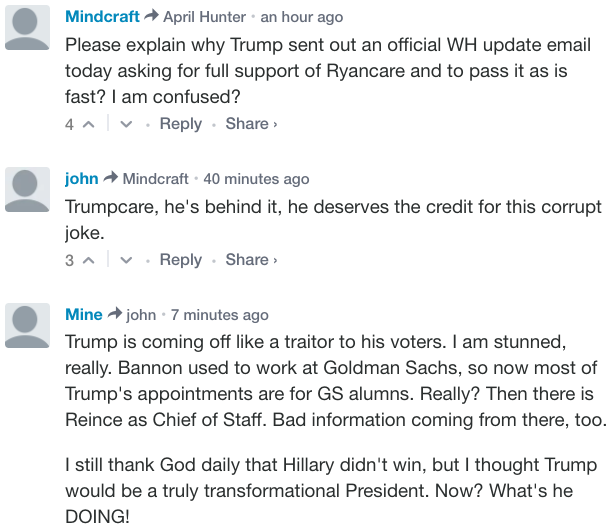 By publicly supporting a policy that will hurt his supporters, Trump appears to have finally succeeded in alienating them.